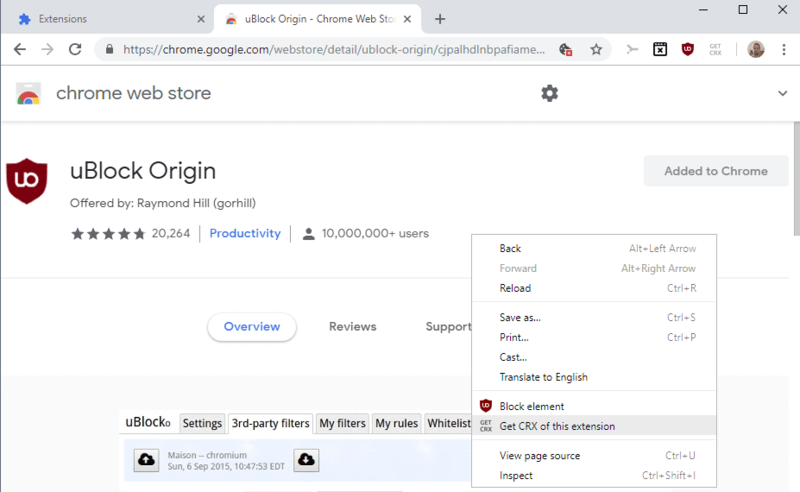 Chrome extensions are not necessarily updated the moment a new version of an installed extension is published on the Chrome Web Store. Google rolls out updates to Chrome, other company products and also extensions in waves. While it is sometimes possible to initiate an update manually, Chrome does not come with functionality to do so. I encountered this issue recently with the popular uBlock Origin extension. Chrome showed version 1.16.18, the Chrome Web Store version 1.17.0. The question that came out of this was simple: how do I force the update of Chrome extensions so that I don't have to wait until Google delivers the update to the browser? Even after 24 hours, Chrome was still listing the older version of the extension as installed even though a newer version was available for more than 24 hours. A quick search on the Internet returned suggestions and tips that did not work. Most suggested to enable Developer Mode on chrome://extensions and hit the "update" button frantically. Doing so did not work on my end and I have the impression that update will only update locally installed extensions and not remotely installed ones (correct me if I'm wrong on this). Anyway, the update button did not work which meant that I had to find another solution. I could have removed the Chrome extension to install the new one. The Chrome Web Store displays "added to Chrome" instead of the "add to Chrome" option and there is no other option to install an extension anew if it is already installed. 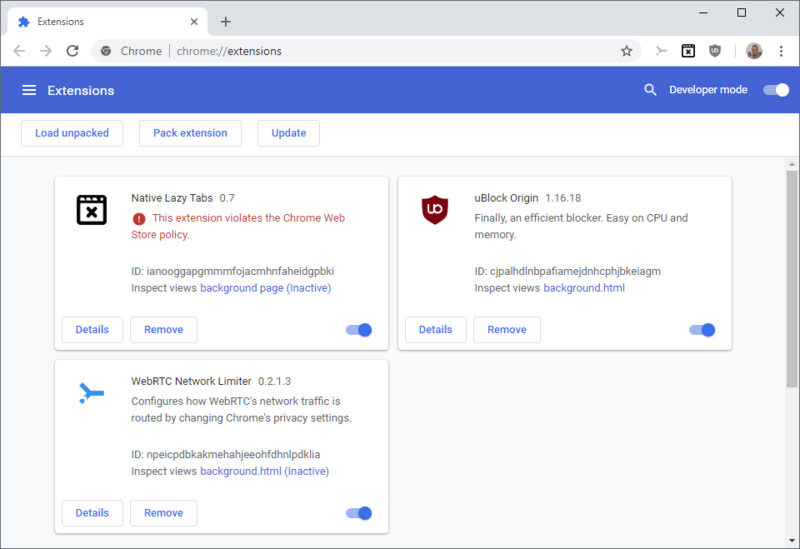 While uninstalling and reinstalling works, as it will install the latest version of the extension in Chrome, doing so may impact personalization and other things. The main idea that I had was to download the Chrome extension from the Chrome Web Store to install the update manually. It is a simple process that worked well whenever I did it. Download the Chrome extension Get CRX. It unlocks download options on the Chrome Web Store so that you can download the extension CRX packages to the local system. Open the Store page of the extension that you want to update. Right-click on a blank region on the page and select "Get CRX of this extension". A download window opens and you can download the updated extension file to the local system. Open chrome://extensions in the address bar. Drag and drop the downloaded extension to the window to install it. You need to wait with the "drop" part until you get the "drop to install" overlay on the page. Proceed with the installation and update as usual. Chrome will install the new version of the extension so that it is updated in the web browser. Please note that the method works only if the Chrome Web Store lists the new version already. Chrome not updating extensions even though a new version is available? Find out how to enforce the update of outdated browser extensions in Chrome. Previous Post: « Don't like Chrome's new sign-in experience? Do this! It used to work for me in the past to update extensions installed such as uB0 by clicking on that Update button, but it has stopped working for some reason. In fact Chromium simply refuses to update extensions at all. It has been like this for a couple of months or so. I assumed they changed something and now use an address which I’m blocking. I have quite a few Google-related addresses blocked by my router. I know this is a bit old, but are you saying if you click on Update via Developer mode nothing happens? If so that is what is happening to me also. Well I get “Updating…” box in the lower left of Chrome, and it never finishes. It only happens on my home PC where I have admin rights. I have the exact same profile, version of Chrome, version of Windows, but on a PC I don’t have admin rights, and it works there. It’s an identical setup bar admin rights. What the heck. I know my extensions do update automatically as I have the same versions of each on both PCs, but trying to manually update them just gets stuck on one. to do our business on. Woolyss Chromium doesn’t autoupdate; can’t vouch for all Chromiums, though. Last version with no webRTC is ver 67. Otherwise google update service off (if it’s there) or registry mod you probably found. Blocking IP’s for extensions is another option for local extensions. Woolyss works, the other methods depend on google not moving chrome files or otherwise changing chrome at their whim; which they often do. Ver 69 in all forms (android ver is repulsive) is a giant middle finger to users. Chrome’s a data collector for ads, don’t expect much. Update worked for me. The first couple of attempts said “Extensions Updated” right away. But, by clicking a few more time I got “Updating Extensions”. There was a delay of about 15 seconds and then UBO was up to date. I had two tabs open … this one and the one for the new UBO. I meant to comment on this one but instead commented in the other one. Your link to “Download CRX” should say “Get CRX”. Thanks, I clarified this. You need to toggle Developer Mode and drag the extension on the page and release it when Chrome displays the “install” overlay. Been doing it since forever & for the ext-s that I want to keep offline for checking their SC. For me, it was as simple as Clicking Update button in the upper left side to the right of Pack extension button. Those buttons would appear at that top of each extension page in Chrome if you have enabled Developer mode. A simpler way to see what version you are running is simply to visit chrome://extensions. The version will be visible next to the extension name. Weird… In my case Chrome on my work laptop accepts this approach with no issue (and I’m no admin there). At the same time Chrome at my home laptop (where I’m admin!) refuses to accept dragged CRXs. Both browsers are configured in exactly the same way. Any tip how to attempt to make my home Chrome accept dragged CRXs? Does the PC that won’t allow it also not manually update? I have two PCs doing something like you are saying. One I don’t have admin rights, and one I do. Manually checking for updates on the non-admin one works, but on the one with admin rights all I get is a box in the lower left of the extensions page saying “Updating…”. It never finishes, but the non-admin only takes seconds to finish. Have you found a fix? Have you found a fix for “Updating…”?